Spray tanning is an effective way to maintain a healthy, youthful glow year round. However, due to the common misconceptions many patients have about this treatment, spray tanning unfortunately gets a bad rap. 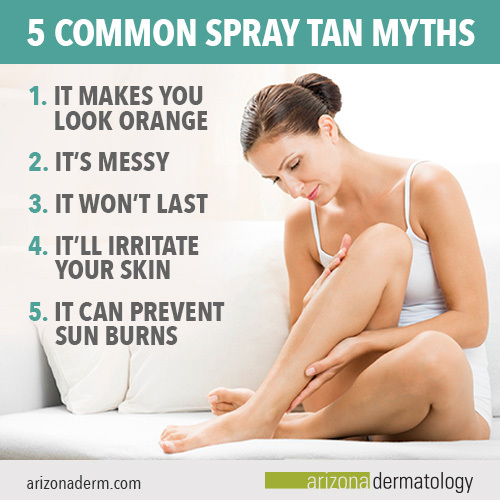 Oftentimes at Arizona Dermatology, we hear our patients share common concerns such as, “spray tanning will make me look fake,” “the tan won’t last,” or “the tanning solution will irritate my skin.” But contrary to popular belief, these concerns are false, as they are just myths. It would be a mistake to let these common misconceptions prevent you from seeking out spray tanning as an effective treatment for a natural-looking glow. Follow along as we debunk the five most common myths about spray tanning. The first, and most popular, myth we hear about spray tanning is that it will make you look orange. When patients experience a bad tan or a tan that leaves them feeling a little orange, it’s usually because the salon they went to offered a limited amount of shades to choose from. On average, tanning salons only offer a few variations of DHA, or Dihydroxyacetone, which determines the shade of the tan. By only offering a select amount of shade options, such as “light,” “medium,” or “dark” the salon is limiting how customizable they can be with your treatment. This can, in turn, cause you to select the wrong shade for your skin type and leave you with a distinct orange tone. However, at Arizona Dermatology, we use a specialized matching system that’s 100% customizable, eliminating the possibility of getting an orange tone. With the freedom to customize your tanning experience, we can tailor the amount of DHA in our tanning solution based on your skin color and preference. This ensures that you’re completely satisfied with your spray tan results. The next myth we hear frequently is that a spray tan is too messy. This is false. We offer clean and professional spray tans using a specialized airbrushing technique. With this technique, we apply the airbrush mist directly to your skin at a high speed, so that no color can run off. Additionally, our spray tans are fast drying so you can be in, out, and on your way in just a few short minutes. The fast drying formula also eliminates the possibility of stained clothes, furniture, or bed sheets. Another common misconception about spray tanning is that the tan won’t last, so it’s not worth the money. But on the contrary, the lifespan of your spray tan is directly related to the quality of the tanning solution as well as the care you give your skin before and after your tan. At our offices, we use a high-quality spray tan solution, which helps the tan adhere to your skin for a longer period of time. Additionally, we recommend tending to your skin before and after your appointment to ensure a long-lasting tan. Although a typical spray tan can last anywhere from four to 10 days, these recommendations will help you prolong the duration of your tan. This ensures that you maintain a youthful, healthy glow for an optimal amount of time. Many patients believe that the tanning solution will irritate their skin; when in fact, it’s quite the opposite. Our spray tan solution is comprised entirely of “free” products. When we mention “free” products, we’re referring to products that are free of any unnecessary ingredients that lead to irritated skin. For example, our tanning solution is oil-free, alcohol-free, and fragrance-free. Additionally, all the ingredients used in our spray tanning products are organic. By sticking to “free” and organic ingredients, our high-quality spray tan solution ensures your skin’s safety. This means that even if you have sensitive skin, you can rest assured knowing that our spray tans won’t cause any unwanted irritations to your skin. The final myth that we hear in regards to spray tanning is that a spray tan can prevent sunburns. In our professional opinion, this is the most alarming and concerning myth because it deals directly with the health of your skin. Patients think this myth is true because they assume that a spray tan works as a base tan. This most likely stemmed from the same assumption numerous patients have about base tans from the sun. For example, many believe that when your skin has a base tan, it reduces your risk of developing a sunburn. They assume that the base tan acts as protection against the sun. However, this couldn’t be further from the truth. In reality, a spray tan provides no more protection from the sun than your makeup does, unless it contains SPF. Because of this, it’s crucial to remember to protect yourself from the sun—even if you have a spray tan—to reduce your risk of developing wrinkles, age spots, sunburns, or skin cancer. Sunbathing is extremely dangerous, as it impacts the overall health of your skin. Sunbathing outside causes your skin to have optimal exposure to the sun’s ultraviolet (UV) rays. On the other hand, sunbathing indoors allows your skin to come in contact with harmful lamps that emit the same ultraviolet rays as the sun’s natural light. Whether its indoor or outdoor sunbathing, both bring negative implications such as sun spots, wrinkles, sunburns, and skin cancer. In fact, The Skin Cancer Foundation reported that about 90 percent of non-melamona skin cancers and 86 percent of melanoma skin cancers are associated with the sun’s ultraviolet rays. The foundation went on to state that an estimated 10,130 people will die of melanoma skin cancer within 2016 alone. In other words, sunbathing of any kind is not worth the risk. While sunbathing both indoors and outdoors can have negative implications on your skin, spray tanning does not. Spray tanning is a great way to maintain a healthy glow without increasing your chances of developing wrinkles, sunburns, age spots, or skin cancer. For more information on spray tanning, the health of your skin, suspicious growths, or any other skin related concern, don’t hesitate to find your nearest location and give us a call. We’re always happy to help.